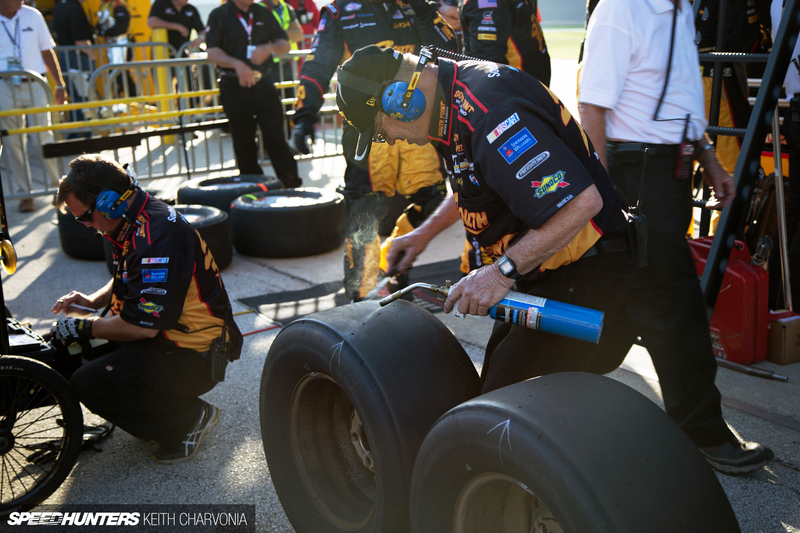 If you’re anything like me, then you probably assumed the only thing going on in a NASCAR pit was fuel and tires. 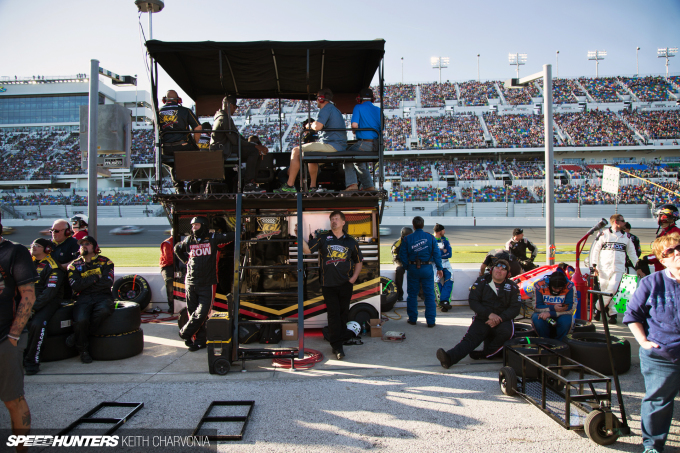 To find out for sure, I watched the Xfinity PowerShares QQQ 300 race from inside the pits. 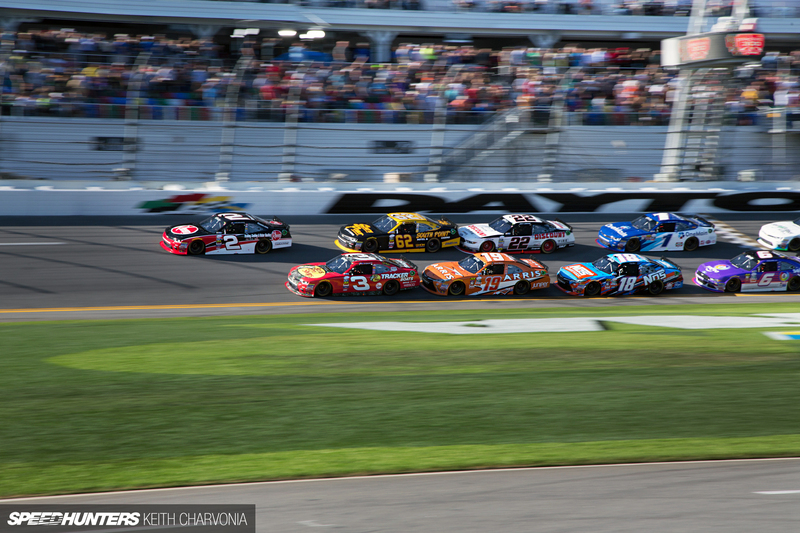 This is the race that takes place the day before the famous Daytona 500, and with every bit as much action. 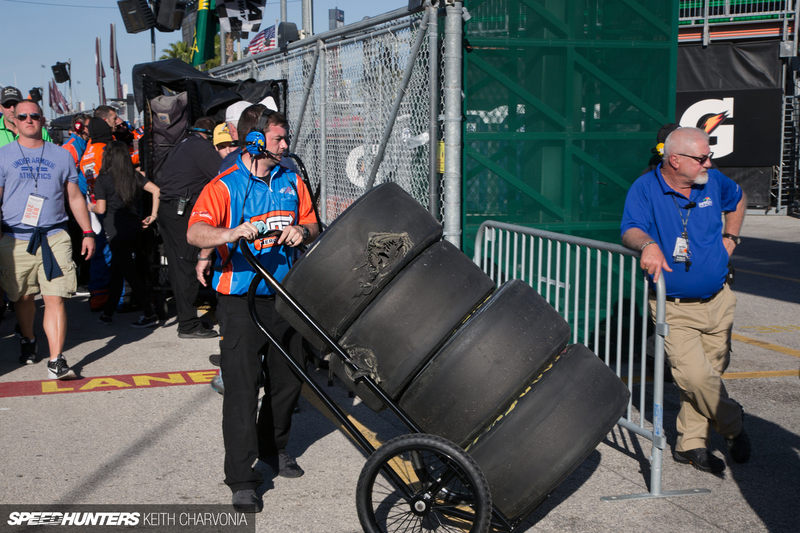 As I first entered the pits, I was greeted by dozens of tires; no real surprise there, right? And the teams were practicing their speed on the impact gun. While the apparatus bolted to a tool box was kind of cool, it still seemed obvious that they would want to warm up their trigger fingers. 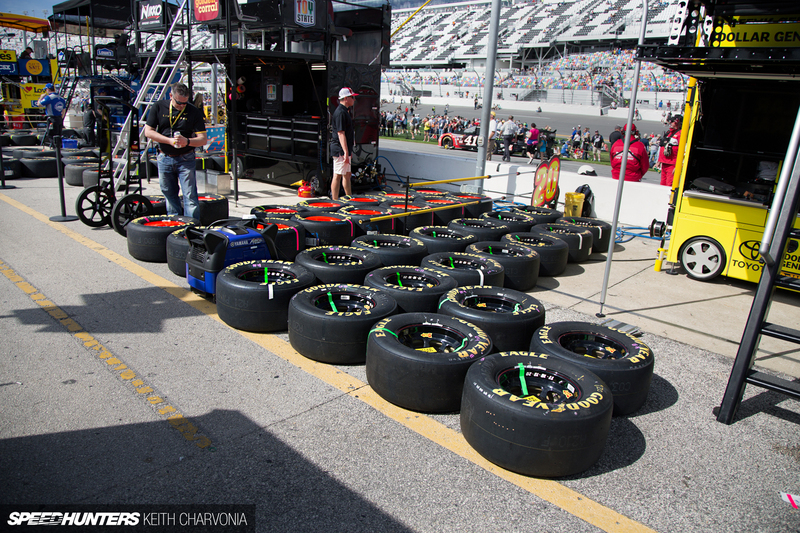 There were hundreds of tires that had to be prepped, which meant organizing them in stacks and gluing in lug nuts. This guy was carefully marking each wheel with a Sharpie to designate its position on the car. 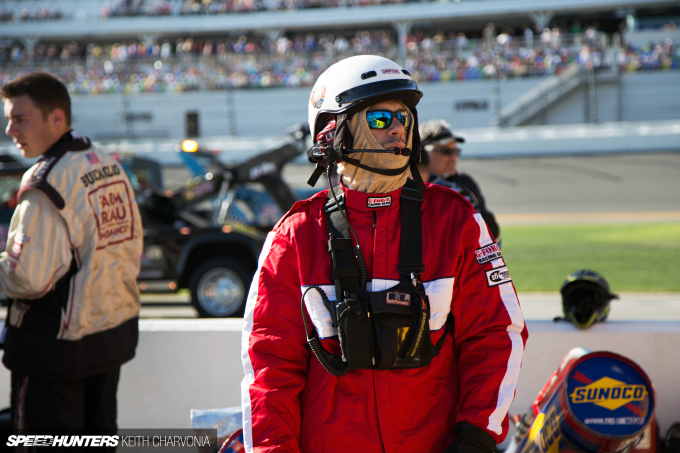 The track safety crew was getting suited up too. These guys rock full fire gear, always prepared for the worst. 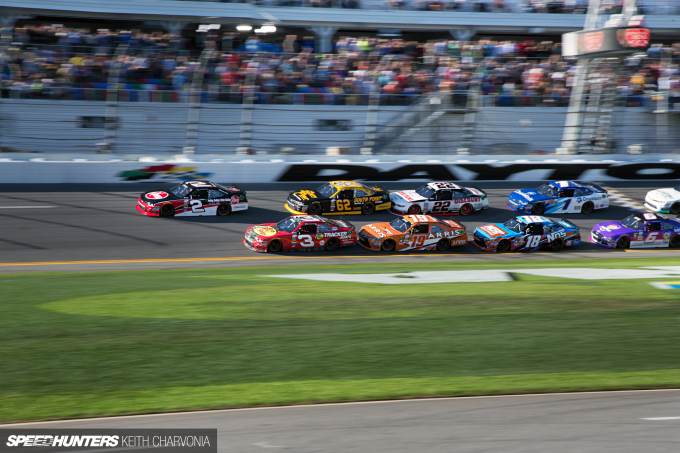 Before the race, the cars are all lined up on pit row. But the festivities wouldn’t last long. 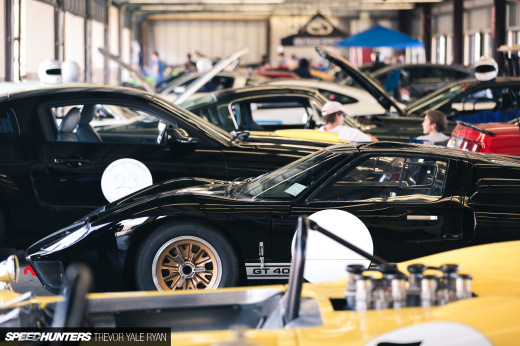 It wasn’t long before the track went hot. 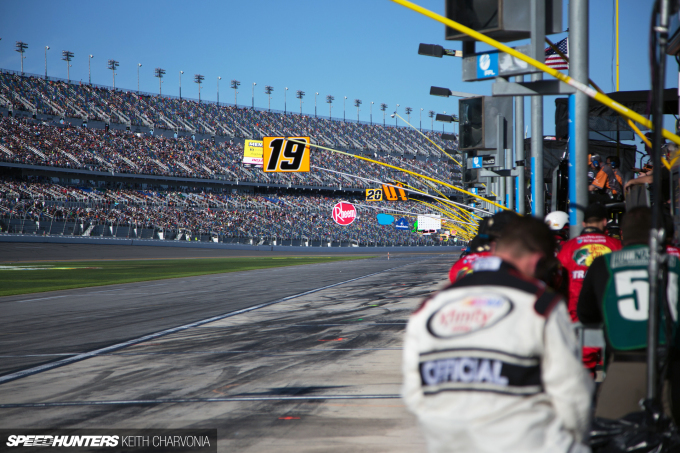 We didn’t have much of a vantage point from inside the pits, but the energy was nothing short of incredible. 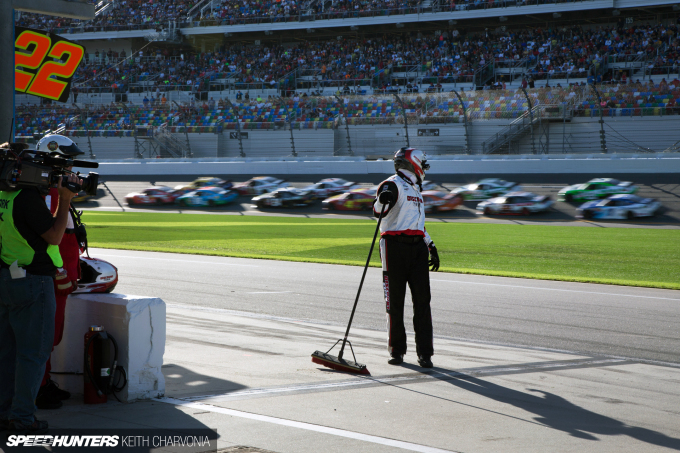 As the pit crew mechanics stood at the ready, I realized there were quite a few other jobs being done too. For one thing, the different gear gave it away. Helmets for some guys, fireproof aprons for others. The part I found most fascinating were these rolling tool boxes, which doubled as command centers. Sitting on top were key personnel for each team, plus the wives and children of the drivers. 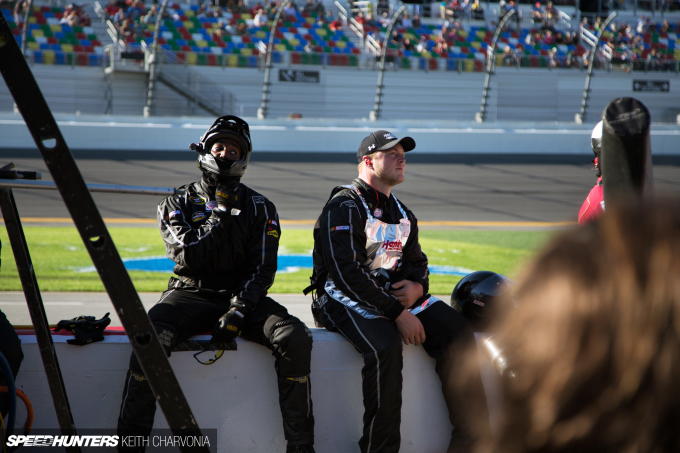 They had monitors and headphones, no doubt coaching the drivers through the race. Notice which way everyone is looking though? While we had a front row seat from the pits, it was only of the start/finish line. 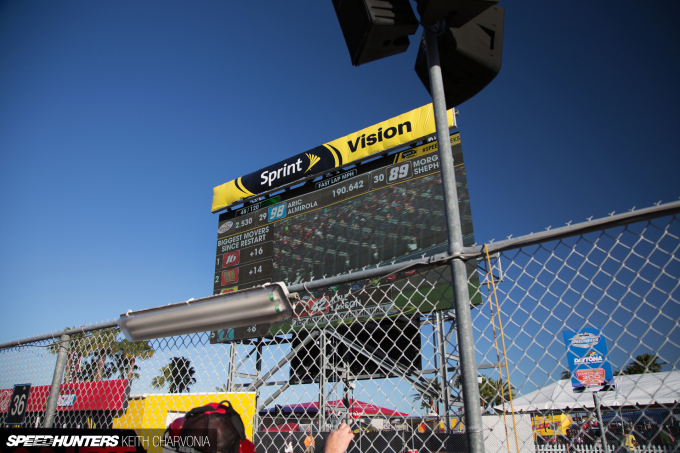 To see what was going on around the rest of the 2.5-mile track, we all had to turn around and watch the Jumbotron in the infield. There was definitely a VIP vibe behind pit wall. We even spotted Cuba Gooding Jr.! 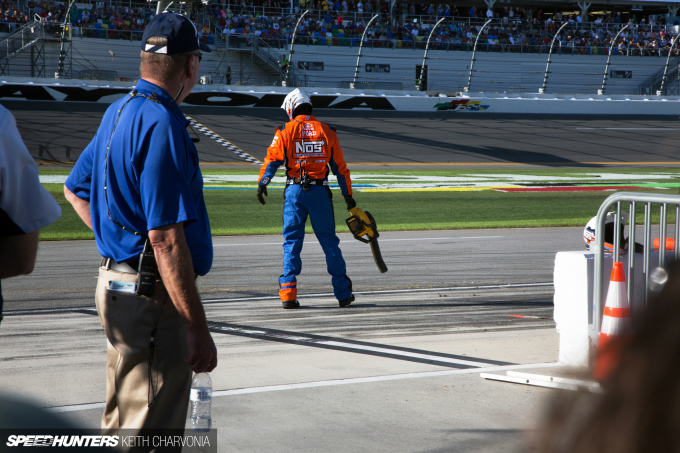 I worked my way down pit row and back, looking for a shot of the track. It was no use however, as with such a limited field of view there weren’t many shots to be had. 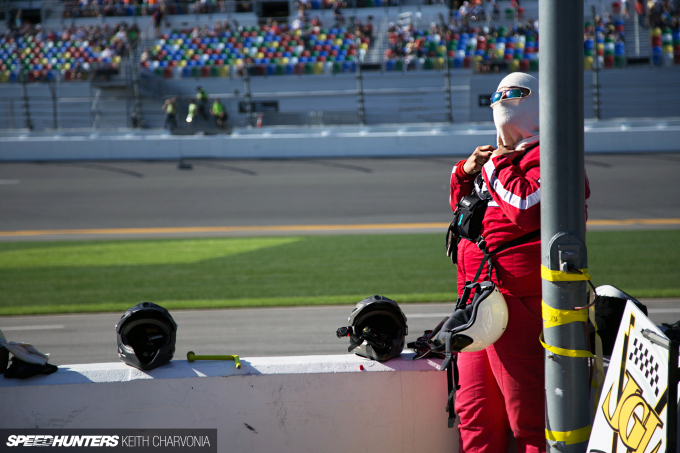 No matter though, there was plenty to see inside the pits so I just sat back and waited for some drama to unfold. 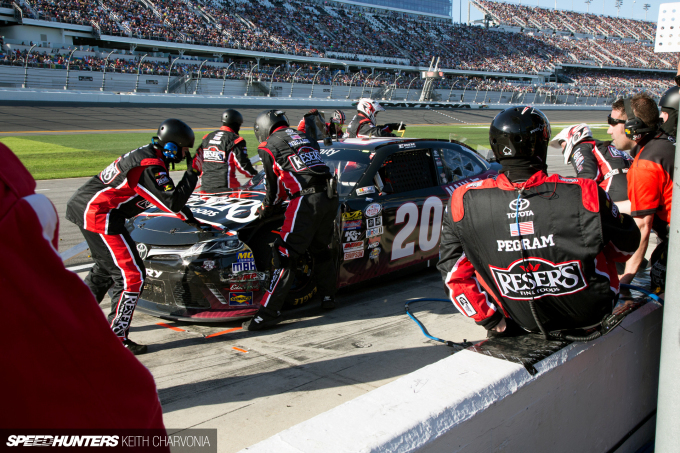 Before long I found myself in the right place at the right time, as the #20 car of Erik Jones pulled in with significant damage. 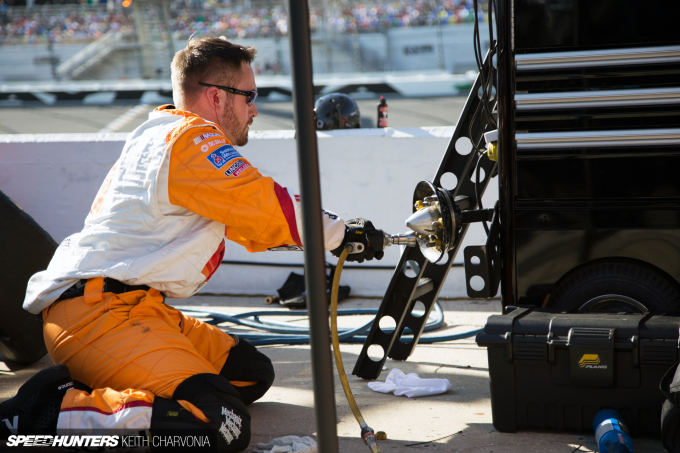 Notice they’re still adding fuel and making suspension adjustments with a crank handle in the rear as the rest of the team yanks at the bodywork to make tire clearance. It was quickly determined that the alignment was off, so over the wall went a big aluminum gauge. Now I was intrigued. 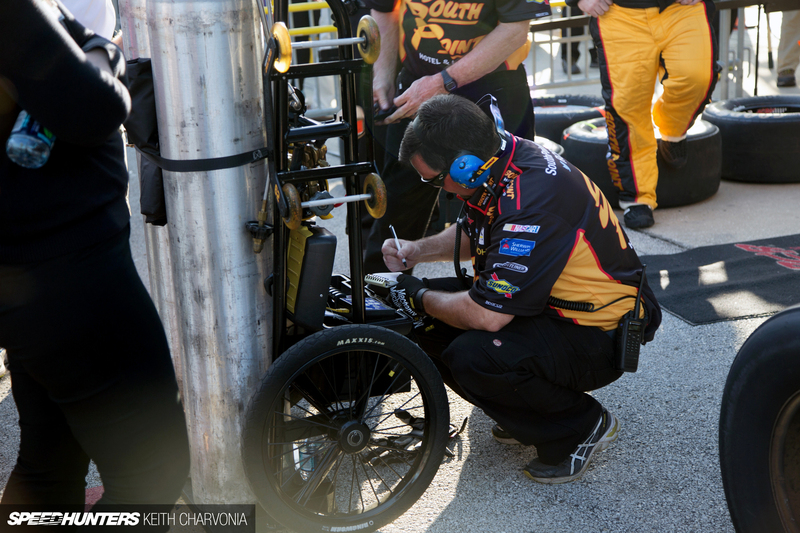 They spanned the gauge between the front and rear wheels on the far side, and adjustments were made in mere seconds. Notice the official carefully watching over this procedure. This was all over in less than a minute, and it was amazing to see how quickly they could work under pressure. Just another day in the office for these guys. Midway through the race the fuel cans started coming out. 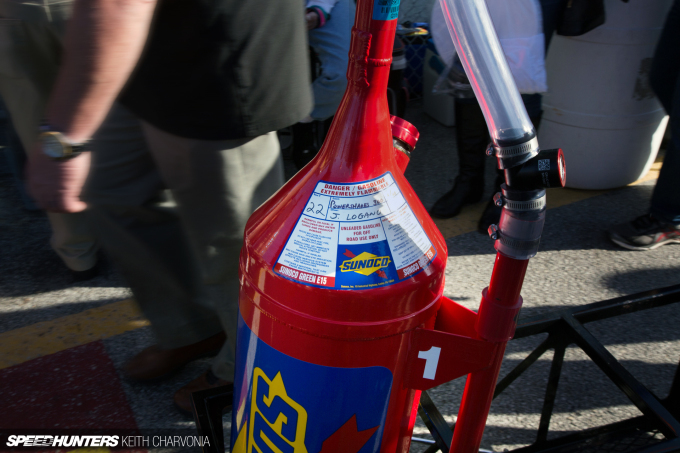 Notice Joey Logano’s name on this jug. 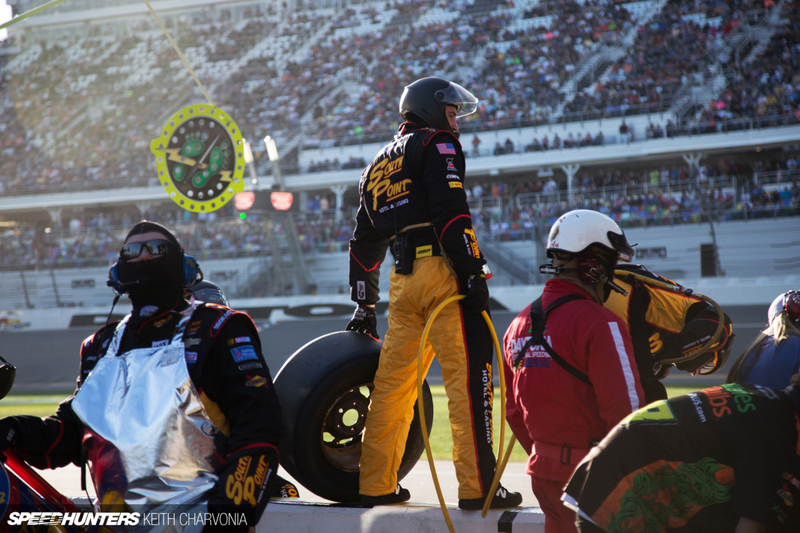 He was one of several big-name drivers to run both races, back to back on Saturday and Sunday. 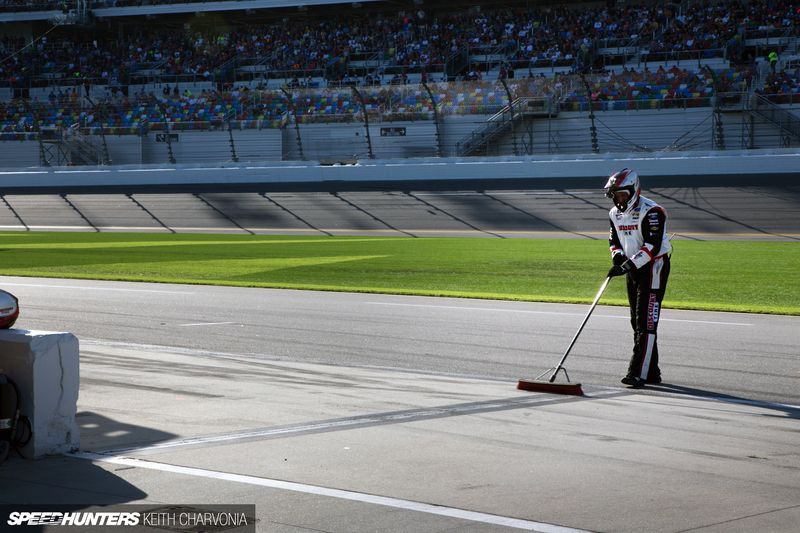 Between stops the crews kept their bit of the track clean. Leaf blower or broom, I was impressed with the pride they took in their respective chunks of pit row real estate. Of course, you have to look when the field thunders by. 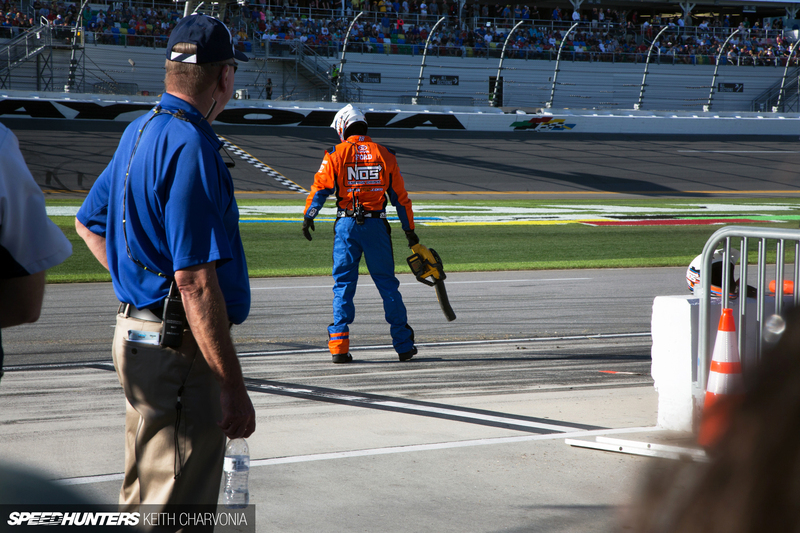 After seeing the first pit repair, I was keen to see more action. I’m just a nut for intricacies like this. I wanted to see exactly how these guys tackled problems on the fly. I saw another damaged car arrive, but wasn’t able to get there in time. 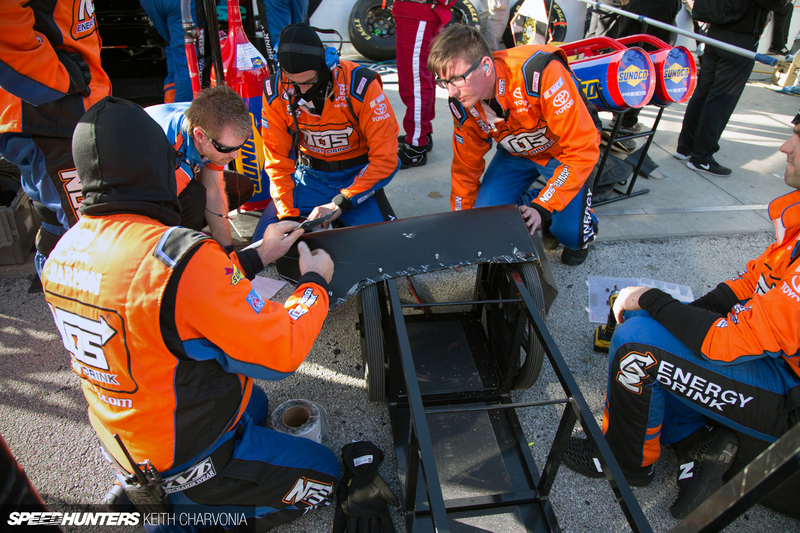 Then I realized the guys were still working on a solution even after the car was back in the race. Out came the self drilling screws and duct tape. The team either had the piece of bodywork that broke off the car, or a replacement panel they were planning to fit. I carefully listened in; they were discussing where to sink the screws so it wouldn’t interfere with the tube chassis beneath. They also planned out which way the replacement panel would overlap, then applied a large swath of tape so the new tin (okay, it’s probably carbon fiber) could be affixed as quickly as possible. 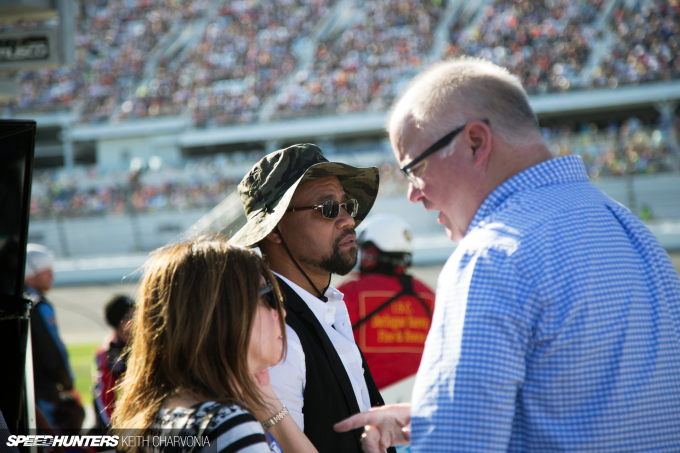 I might have been missing the battle on the track, but I was enjoying these behind-the-scenes realities more. I continued to observe, and realized that someone on the team had to keep detailed notes of what was done to the car and when. Makes sense, right? This was another common sight. As the tires came off the cars, a propane torch and putty knife were used to clean off the the wear dots. I’m not exactly sure what they were trying to see, but everyone followed the same ritual. 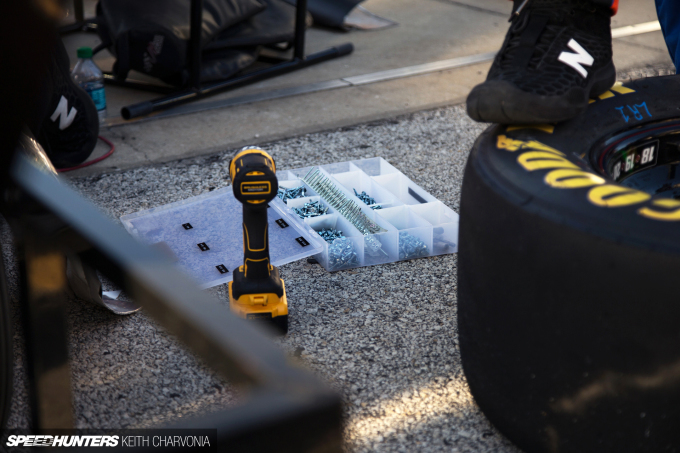 Tire position on the car is paramount, as I would imagine different pressures and tread life have an impact on strategy and performance. Just like the fuel carts seen earlier, everyone seemed to be rushing around with a stack of tires now; it must have just been that point in the race. Check out the flat spots on this set. These tires carried a different type of wear, with the sidewalls completely separated. 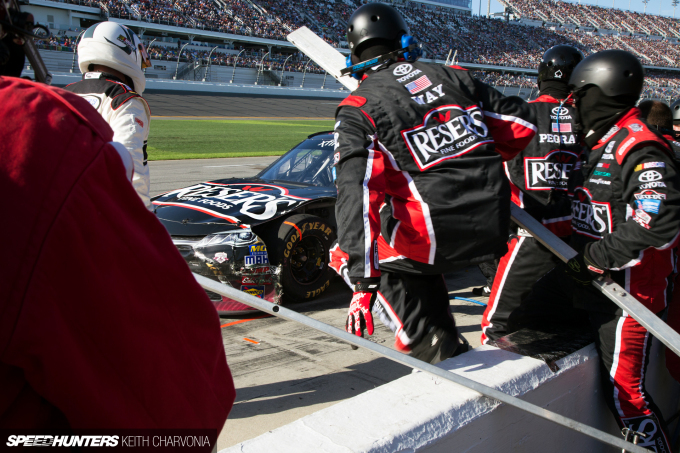 I had so much fun watching the action inside pit row that before I knew it the 300-miler was over. 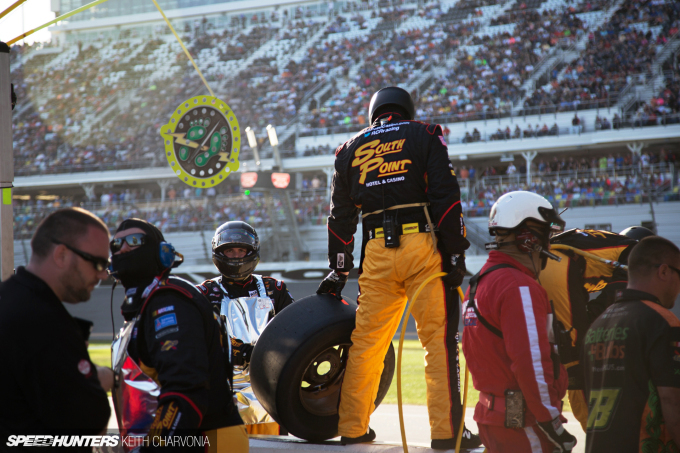 So just like this pit crew, I packed it up and headed out. 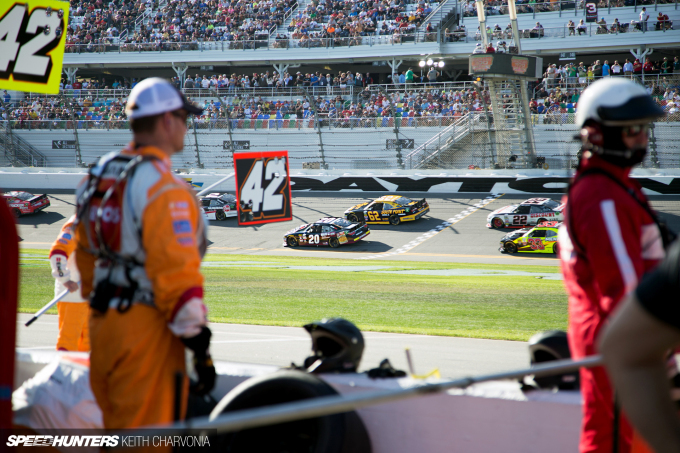 I went to Daytona for the Rolex 24 Hours. The difference in technologies between those two events is amazing. Why are they still using 5 bolts wheels ? Why not? 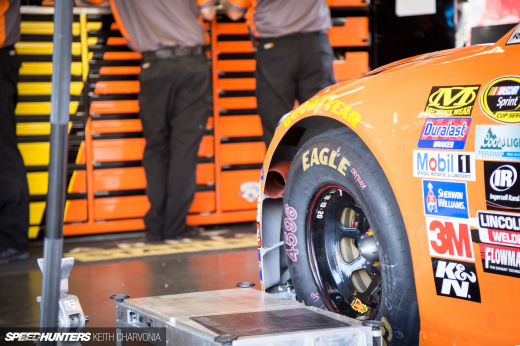 NASCAR has never been about bleeding edge technology. Or even cutting edge technology. Besides formula 1 pits are so fast they are kinda boring. 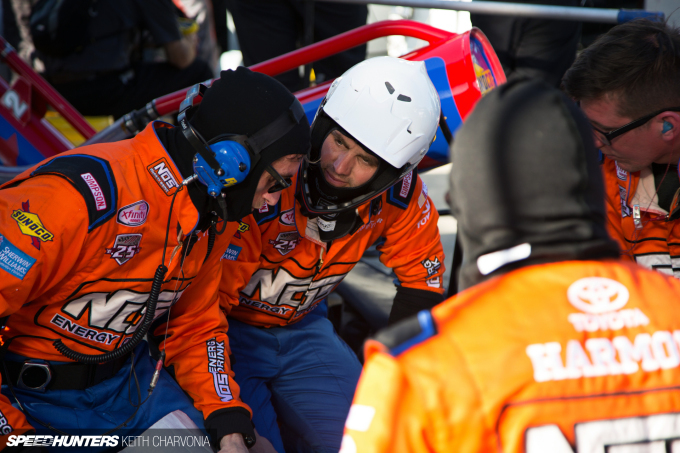 More time in the pits equals more time for drama. For the tradition and the spectacle. As long as everyone is using the same system, it doesn't really matter what you use. Only time single lug is really an advantage is when others are using more than a single lug. 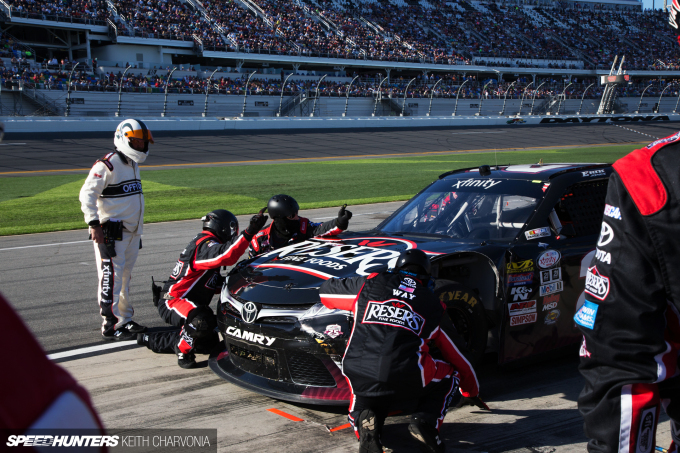 The determining factor in a pit stop is the amount of time it takes to put fuel in the car (which I believe is gravity fed). 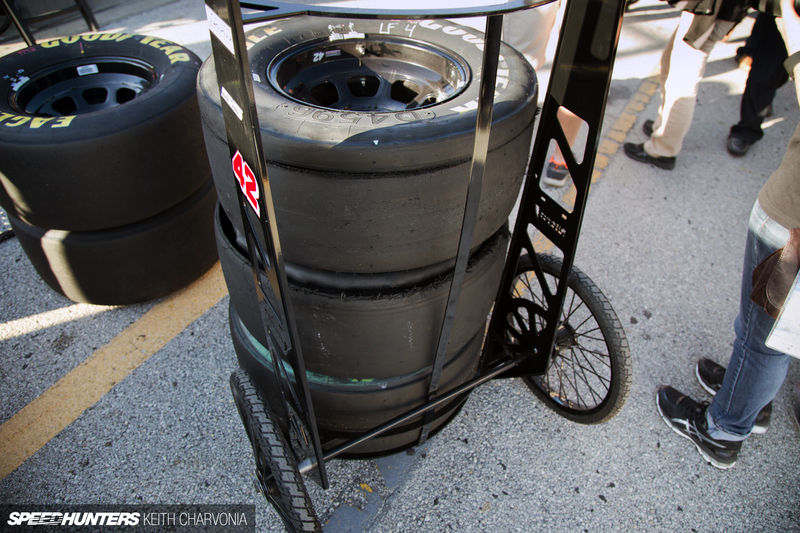 If they used single lugs, the tires would be done way before the fuel. With the 5 lugs, it forces the crews to work extremely hard to get the tires done before the fuel, which makes it a race within a race. The 5 lugs also add another dimension to the stops, where crews will cheat to save fractions of a second and only tighten a few of the lugs per wheel. 200mph with only 3 lugs tightened is not uncommon. 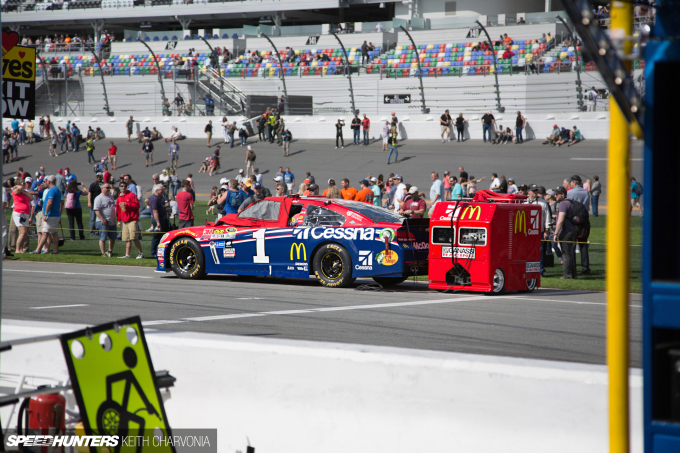 NASCAR is not a sport about pushing and developing the latest and greatest gizmos and gadgets, or keeping up with the newest techno wizardy - although the cars are very advanced in their own regard. 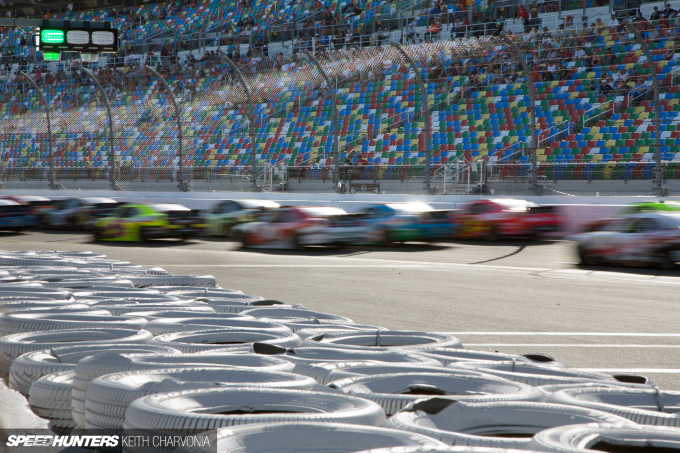 First and foremost, it is about racing. 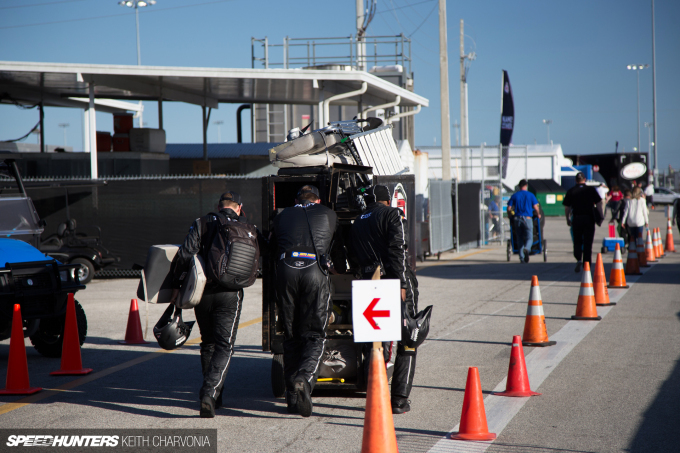 You don't need the latest electronic controlled this, or GPS controlled that, to have good racing. 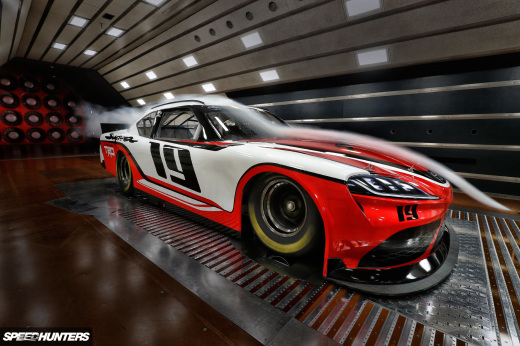 In fact, many of the best racing series in the world - Aussie V8 Supercars, British Touring Cars, even Indycar - focus on keeping many things as basic and raw as possible because it enhances the spectacle. If it was all about constantly using the newest and "best" technology, every racecar in the world would have traction control, stability control, ABS, active suspension, active aero, etc. Formula 1 has unfortunately twisted people's thinking that the newest tech inovation is the best way to go racing. If you look at the current lost and directionless state of F1, I think it's pretty easy to make an arguement to the contrary. The reason tech inovation works to a certain degree in F1 is because F1 is still a constructor and manufacturer based series, whereas NASCAR, V8SC Indycar or BTCC are much closer to a spec series now (which has pros and cons, but that's another discussion). All that said, F1 is right in the thick of it in terms of trying to figure out how to work a lot of the tech OUT of the cars because the series has become so stale and boring. 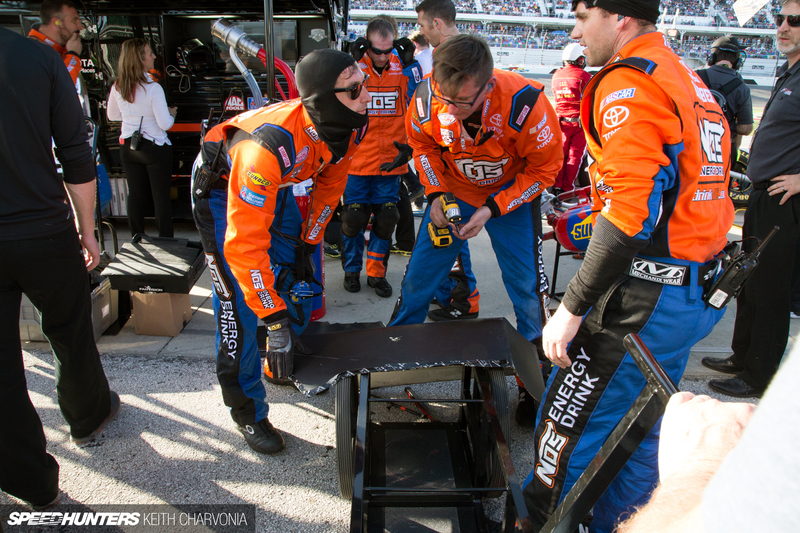 Speaking of F1, it's amazing how these NASCAR pit crews can make due with a tool box that doubles as an engineer's stand, while F1 seems to require 6+ big rigs per team, which transform into 5 star luxury suites for entertaining high profile guests. Williams just got a new, shiny, pivoting front jack for the low low price of $200,000......and then they complain that the sport is too expensive and they need to find a way to cut costs. Go figure. Opening pic.. That guys apron game is so strong. Great Article! More behind the wall stories and pics would be appreciated! Great pics as always Keith. Glad you were able to get to one of these events, but I think the article is a bit lacking on the writing, especially the end, it seems like you were just "whipping this out" rather than writing an article. Still a good read though! Serge914 I think the reason NASCAR keeps so much old tech around in their cars is because anytime you change anything, you open the rulebook to interpretation. Each of these teams have at least one specialist whose job it is to go through the rulebook with a microscope looking for any area they can find the smallest advantage - and they are GOOD. The older tech on the engines is a known quantity, and makes it easier for the NASCAR inspectors to see if there is any cheating. Keith, the guy with the torch is just cleaning off the wear dots so they can be measured with a depth micrometer. 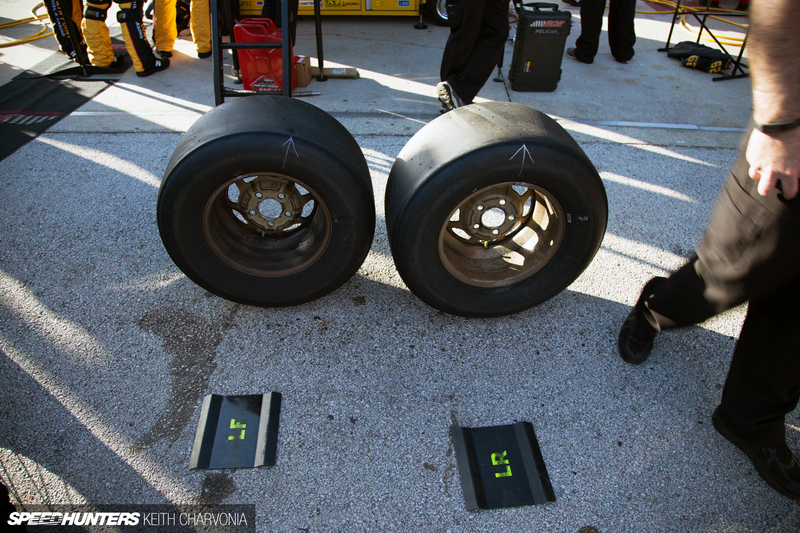 They are also measured before they go on a car, so there is a delta measurement. The sidewall arrow obviously marks the row already measured, so the post-race measurement can be taken in the same spot. 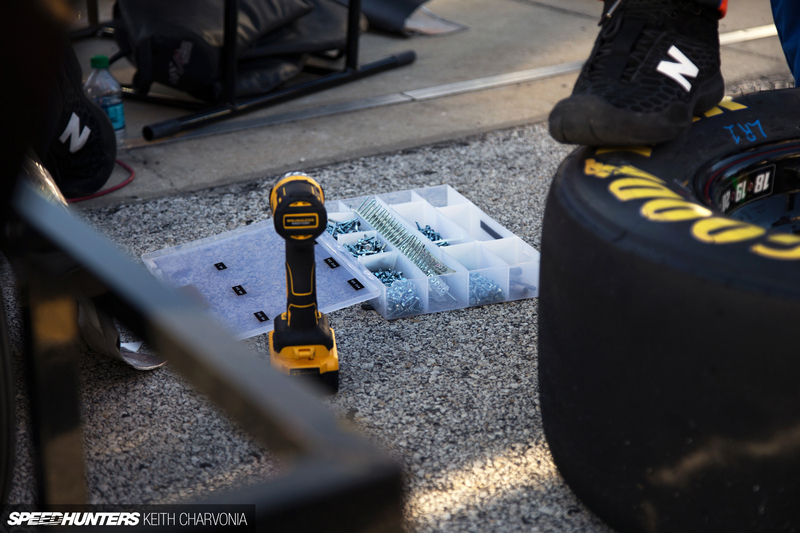 You must not have seen any tires with a row of numbers written in silver Sharpie along the row of wear dots, either on sticker (new) tires or used tires. Some teams to do that and then record the numbers later, and some teams enter them directly onto a tablet. It depends on how busy they are and how many sets they need to knock out quickly and can then enter the numbers in their less hectic time. Serge914 Because it's less expensive, and it makes a better show, and it has more of a passing resemblance to the car in your driveway. It's also easier to change setups with wheel spacers, etc., and just change to longer/shorter studs if needed (it's a 5 minute job). Basically, it's simple and very effective. @fabrik8 Great info, thanks for that. Do you work in this field? Matt Khoun It would be tough to beat. KeithCharvonia Yes, yes I do. Great work Keith, look forward to more like this.